I have incorporated my love of salted caramel with my new invention “the cake slice”, which I accidentally hit upon when making a slice recently. A cake slice, in my definition, is a traybake or slice in which the base is “cakey” and the topping quite soft and maybe a little bit gooey! 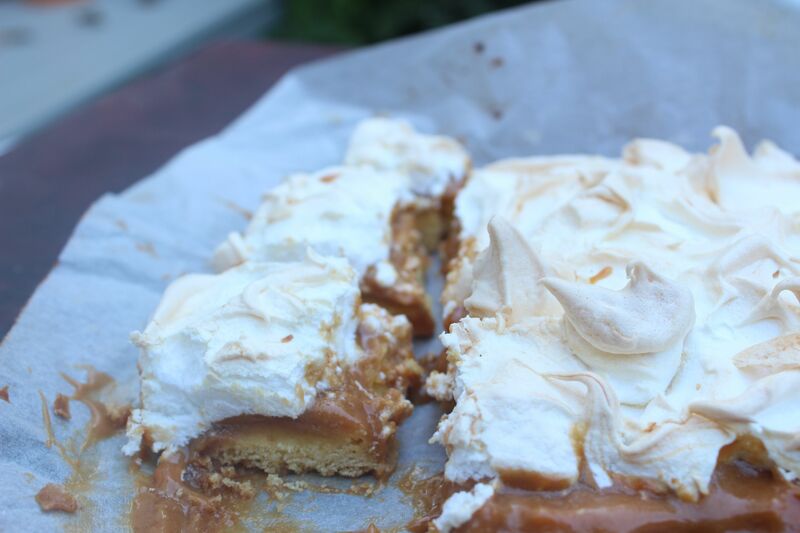 That recipe combines a rich shortbread base with an apricot jam and meringue topping – I substituted the jam for a salted caramel filling in my version, plus I tweaked some of the measurements. I used some Dulce de Leche in a jar – enough to cover the shortbread. I added a tablespoon of butter and also of demerara sugar and blitzed in the food processor to combine to loosen the caramel. I think that the additions may not have been needed as the mixture was a little runny. Add sea salt to taste for the “salted” effect. Cream butter and sugar in a food processor. Add beaten egg yolks and a little water. Mix in sifted flour. Roll out to about 1/2 cm thickness and place in a baking tin lined with baking paper and greased. Bake for about 10-15 minutes at 160 degrees C or until biscuit is cooked and golden. Remove from oven and cool to room temperature. Spread the biscuit with the salted caramel to cover. Beat egg whites until stiff, then add the remaining 1/3 cup sugar, beating mixture until of meringue consistency. 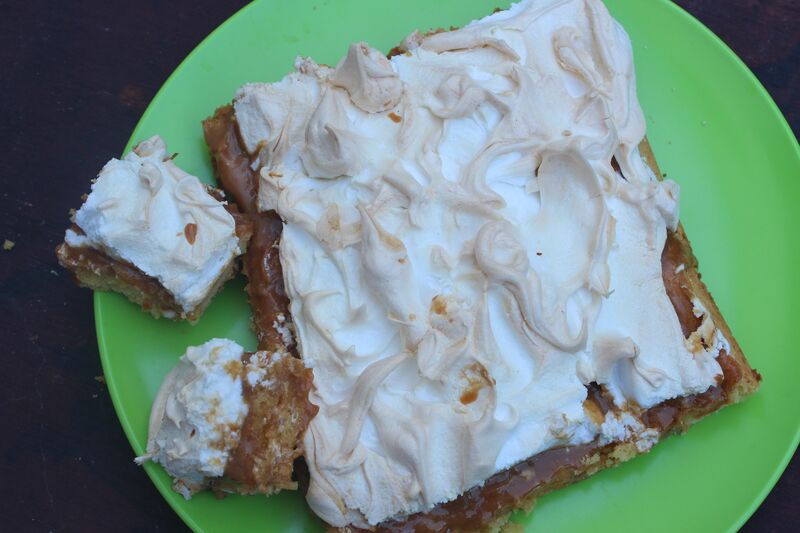 Spoon the meringue over the caramel, creating rough peaks. Bake in a slow oven (130 degrees C) to dry the meringue for about 15 minutes. 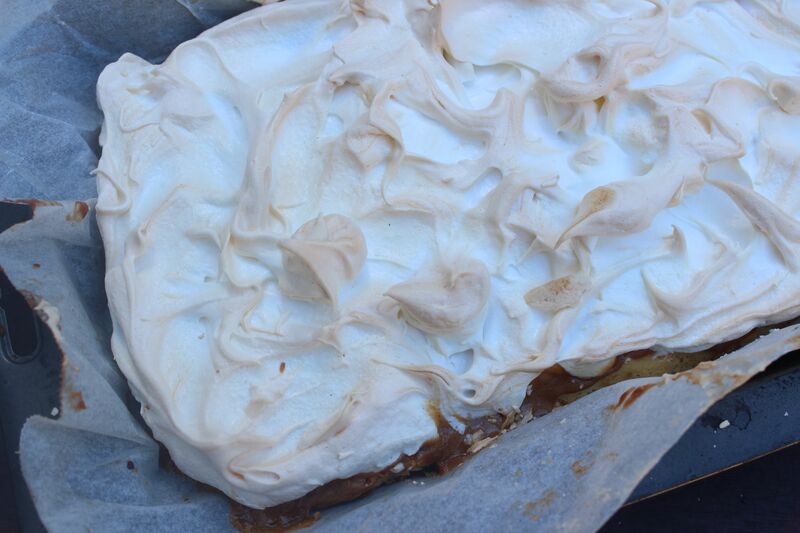 The meringue should feel firm but spongy. Remove from oven and when cool, cut into “cakey” slices. Posted in Biscuits and Slices, Cakes, Meringues, Small Baked Things, Sweet Food and tagged afternoon tea, cake slice, dulce de leche, meringue, morning tea, salted caramel, traybake. Bookmark the permalink.